Who is every kid's favorite, fun loving, cartoon mouse? It's Mickey, of course! He's always getting into exciting adventures and trying out so many new jobs, it's impossible to know what he might get up to next. 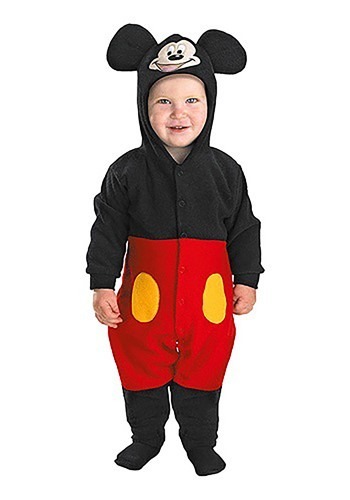 When your toddler is all dressed up in this incredibly cute Mickey Mouse Costume, they'll look ready to go on some imaginary adventures of their own! One of the most fun things about Mickey is that he likes wearing costumes, too, just like your little tyke does. Over the years, Mickey has been a steamboat captain, a construction worker, a plumber, a movie maker, a treasure hunter, and even a sorcerer! Well, technically he was a "sorcerer's apprentice," but he probably got promoted to a full sorcerer eventually. Anyway, Mickey is always ready to put on a new costume and try something new. So, while your toddler is already going to look adorable in this official Disney jumpsuit, you can add accessories, like a magical wizard cap and robe, or a fancy little bow tie, to make them look even cuter than before! This precious, one piece jumpsuit is made of cozy flannel, with snaps along the front and around the inseam for convenience. It gives your little one the look of wearing Mickey's famous red shorts, complete with yellow button details, and the hood is embroidered with Mickey's smiling image, and topped with big foam ears. Add any accessories to give them a unique style for Halloween, or have fun with their favorite mouse's classic look!